The best thing about having a shop: you get to put things in it that you love, that you want other people to love. And yes, Ann and I have to agree on what makes the cut, so all items in the MDK Shop are guaranteed to be fully charged with DOUBLE LOVE. Two persnickety knitters love each and every one of these things. The story of Interchangeable Needles and Me is personal and opinionated, but I think it might have resonance for other knitters. Can you handle the realness? Here’s my beloved circ “organizer,” handmade by Cristina Shiffman lo these many years. The other great advantage of interchangeable needles is that you can change the length of the cable to accommodate more or fewer stitches as you increase and decrease. This lets you use the same needle tips through a complex project, such as a sweater, which helps to keep a consistent gauge. You can knit the neck on the shortest cable and the body on a longer one. If you’re swoncho-ing or slanket-ing or otherwise working an epic number of stitches, you can even connect two cables to make a super cable. Many years ago, I tried one of the early interchangeable sets. The needles were hollow plastic. They clicked on easily enough, but one day a needle snapped off while I was knitting, sending liberated stitches flying. I was traumatized, to say the least. 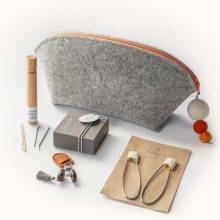 The convenience of having a full set of needles at my beck and call, in a tidy clamshell box, was outweighed by anxiety about reliving that experience. Every time I knit with them after that, especially with a heavy or not-very-slippery yarn, I braced myself for disaster. Over the years, interchangeables got a lot better. Many fine needle manufacturers make them now. But I resisted. Like all knitters, I’m picky. If I didn’t like the slackness, or non-slackness, of the cable, that was the end of it. If the needles were not pointy enough: hard pass. There were even aesthetic obstacles: I like a simple, functional presentation; I don’t want to be putting something clunky into the curated happy place of my knitting world. But the big reason for my interchangeable avoidance was always this: fear of the needles detaching from the cable. All the sets that I thought looked good either had needles that could (and did) detach without warning, or required using a tool to affix the needles securely. 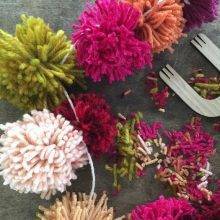 Memories of that miserable moment, and a reluctance to fiddle with small tools that I might lose, kept me accumulating random needles and rummaging for the right one when it was time to cast on a new project. Then came the glorious day, this past June, at TNNA, the yarn industry trade show. An excited pal came up to me with a lightweight bamboo circular needle, made by a company in Japan called Tulip. “Have you seen these?” The tip was pointy, the join was as smooth as any circular needle I own, and the cable had a perfect amount of slack. The Tulip Interchangeable Needle Set. I made a beeline for the Tulip booth, to inspect these wonders. And also to cross-examine. Q. How do the needles get attached to the cables? A. You screw them on. Q. Do you need a tool to secure them? A. Nope. Just screw them on. Q. Do they come unscrewed? And then the kicker. They had a question for me: would I like to try a set? Reader, I took them home. On the plane, I cast on my first project on my Tulip interchangeables, and I haven’t looked back. I can’t think of a project that I’ve knit since June on any other needle. The needles have never come unscrewed, or even loosened as I knit. I’m a multi-tasking knitter, so a secondary question I have about interchangeables is what to do when I need a needle size that is already deployed in another work-in-progress. My Personal Tulips in situ, living their best multi-tasking life. Another issue that comes from multi-tasking: what happens when you’ve got all three cables at work in projects? Doesn’t that render the remaining needles kind of useless? Surely I’m not the only knitter for whom a fourth or fifth WIP is par for the course? There is a solution: more cables. We carry Tulip individual cables in three lengths. Cables take up a lot less room, and are more versatile, than multiple individual needles. Nowadays, I keep my Tulip set in my Main Knitting Bag, because it’s compact and light enough to carry around. The space in my brain that used to be devoted to wondering whether I had the right needle size, in the right cable length, has been freed up. Maybe now I’ll finally memorize how to do Kitchener stitch. Love your gear: the tools and notions we cannot live without. I have that plastic set with just one broken needle so far. These needles are very tempting. 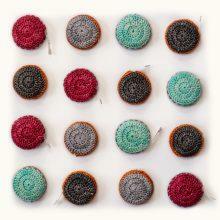 Do you like them enough to donate your circular needle collection to some worthy new knitters? I ours use the extra space my needle collection is currently occupying in a notebook filing system. Well, now I’m really excited to try these slick new interchangeables. And I LOVE the organizer that dear Cristina made for you!! The sight of that Tana Lawn print gave me flashbacks (in a good way)! Meanwhile, at philacraft hq, my collection of circs is in a (nice) box. Over time, I’ve gotten pretty good at eyeballing just the right needle I need, but I keep Susan Bates shut up in that drawer with the needles. And a set of Tulips lives in my project bag du jour. 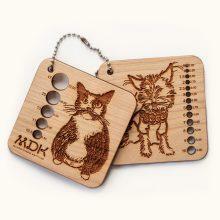 So glad MDK is stocking the set with longer points. I have the shorter ones and they tend to tire my hands out. The cables (no kinks!) and joins (so smoooooth) are perfect. How did I not know that you had a set of Tulips?! That’s so validating to me. And yes, longer points are easier on the hands. I have kind of small hands but a definite preference for the longer tips. I treasure my CristinaShiffman Needle HolderTM, monogrammed with my initials and everything. It has place of honor in my lair! Yes! I’ve found smaller needles to leave my hands crampy, and my hands are very medium (they were actually called small last weekend, but I was amongst giants at the dinner table, so I don’t consider it a valid sampling). I prefer the long ones. I just got myself a full set of Chiagoo interchangeables, which have never come unscrewed (unlike my knitpicks, which constantly did). I love the feel of that metal, but still do a lot of projects on my bamboo dpns, which I love. The Tulips are very tempting…. It’s a precious relic of Ye Olde Bloggey Days of Yore. And still hanging very tough. Needs a good clear-out now that I have Seen the Light of Interchangeable Needles. I could winnow it down to just the super small and super-large size needles, and put the rest in a drawer in case of emergency. You have drawers that aren’t already crammed with stuff????? Be still my heart! My mother was Queen if keeping for an emergency. I think it was a depression-era thing. My fave: a visiting aunt came in from rain all wet. Me: “Oh we have so many umbrellas you should have taken one.” She completely deadpan as only a born and bred yet transplanted NYer can be: “I did.” (Natural 1/2 beat hold of said NYer) “It had holes in it.” My mother: “OHHH, you took the one with holes!” Me with incredulous cousins watching: “What?! WHY do you have one with holes?” Same deadpan Cadence with strong NY accent “For emergencies.” Yes, hilarity ensued. Even she had to laugh. But oh she tried not to as I sputtered “but it doesn’t work in emergencies!” Never mind that my mother categorized the possibility of rain in NYC as an emergency. Btw, I love dpns for socks. Yes, I’m finally knitting another sock. A resoleable [sic] one. I never retire an umbrella! You never know! These look amazing! Thank you for the thorough review. Love those supple black cables! Was so disappointed the color cables are not the same. Is there a way to order more of those supple black cables? These sound really interesting ! The only thing I don’t understand is why all those interchangable sets start with size 3. Most of my projects are knitted with size 0 – 2 , so I always have to buy those sizes separately ….. I have the same problem, but I found a Chiagoo set that is 00-1.5 mm. Sharp enough to be a weapon. Just purchased that set and promptly drew blood, which makes them a keeper. Nothing quite as annoying as a rounded tip on a knitting needle. Joins weaken below that size range. I bought the ChiaoGoo minis and they have broken (too much pressure on the very skinny metal joins). It’s because the join itself has a diameter larger than that of the US 2 (or whatever) needle. If they made the smaller tip the would be an annoying bump where the join is bigger than the needle. 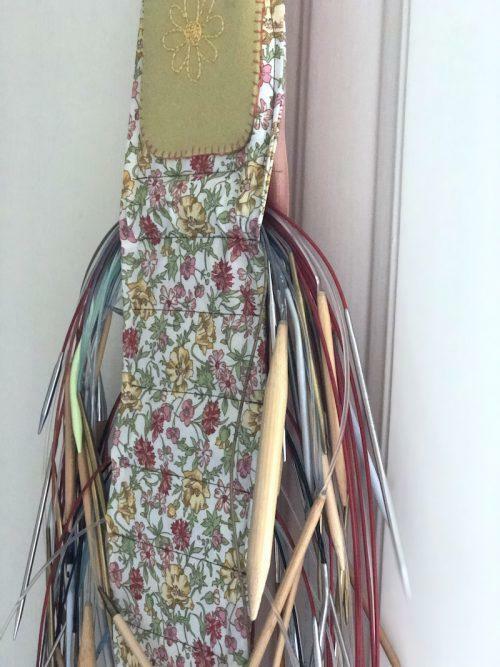 I have a set of Tulip crochet hooks and love the quality. This set of needles is very tempting. Thanks for the review. Looks like a nice long needle, too. Off to check details and see if I have a Christmas gift hint candidate! But, is there a solution if you are using 2 circs at once other than buying 2 sets? You could just keep changing the tips to the other cable, but I can see how that would be annoying. This doesn’t come up for me very often. Sometimes I knit a sleeve on 2 circular needles the Cat Bordhi way, and in that case I guess I would go to my fixed circular collection for the second circ. I don’t think I’m up to managing 2 sets of interchangeables! I don’t use that method, so maybe this is a obviously dumb suggestion … but what about using the correct size tip on the “right” (working) side of each circular needle, and going down one size for the tip on the “left” (passive) side? Oh man that is brilliant. It would work for me. A brilliant idea, like the Addi Flex Flips. I’ve done it out of necessity with just one circ. But, like you, would never have understood what they are saying just by reading it. Try it… MAGIC!! Today’s comments & exchanges seem especially great today. I MDK Community. I am also spatial relations-deficient. I don’t know if taking up knitting has helped that, but taking it up in mid-life it has kept my basic math skills in good working order! I often guesstimate in my head but then confirm with a calculator. I just got this needle set, and they are so insanely smooth I can’t stop touching them! (yes I know that sounds weird) This is a high quality product! Love them! I used to think all bamboo needles were the same but that is definitely not the case! I wish I could “like” this. Hell, I wish there was a way I could try these out without a plane trip. I have KP interchangeables, and they keep coming unscrewed. It drives me kookoo bananas. Do u use a tightening instrument? Aside from the one provided I find that some blocking pins work, as does an unfurled paper clip. It really makes all the difference. My problem is breakage & glue ungluing. (The 11, which I’ve never used unglued itself just sittin’ in the case! I’m guessing it felt that it needed to move after so many stationary years.) 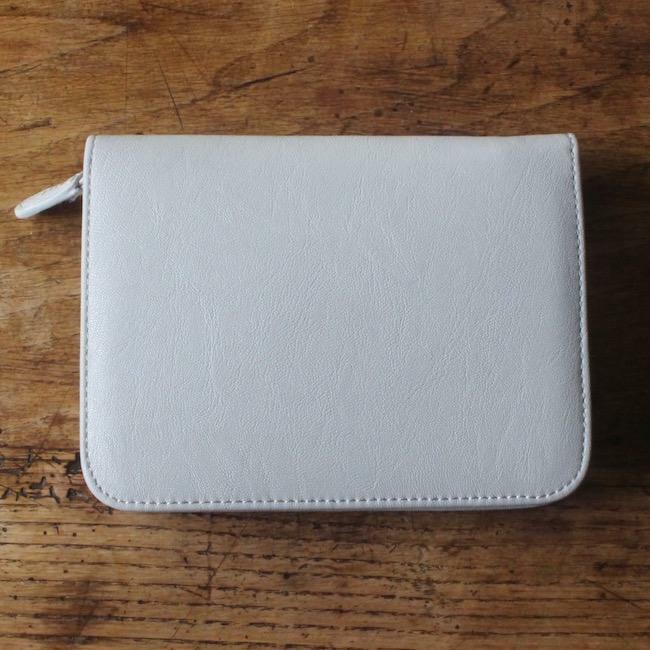 But because I was an early adopter thankfully I have lifetime warranty on every piece. Even so, those Tulips are mighty tempting. The only knitting needles I have ever broken are KnitPicks. I still have a few left, but won’t purchase any more, as the unscrewing also bugs me. If I have occasion to use them, I compulsively check the joins as I am knitting. And, similar to your ungluing story: I recently had a KnitPicks interchangeable drop a tip while just hanging with all the other circular needles. These look oh so tempting. I do like bamboo needles quite a lot, but from time to time I break one. Are there replacements available if you happen to lose, break or otherwise are forced to retire a needle tip? I mean, life happens. Gosh that is the unthinkable, isn’t it? [Throws salt over shoulder.] I’ll look into this question with Tulip. They would be perfect if the set included a 16″ cable. Oh rats. I eyed that set when you ladies had free shipping. But I held back. Silly, silly me. By the way, I have never had my Knit Picks interchangeables come undone. As long as I tighten fiercely with the little tool, all is well. However, I don’t love the cables. Try LYKKEs. 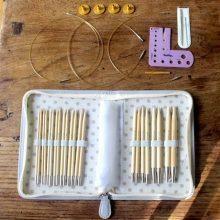 I was always using ADDI circulars but now in many cases I prefer the LYKKE instead. I LOVE them. I just had a Lykke circular come unglued (while in use, of course). It broke my heart because I loved them up to that moment! Are the Tulips slick? My preferred needles are wood, slick, sharp, but not too sharp. So far I’ve been lucky with the Knitters Pride interchangeables. Took me years to figure that out. You’ll have to try mine. They’re smooth but I wouldn’t say slick, especially not as compared to metal. Great, thanks, Kay. The wood + slick combination has been hard to find. You know those cosmetic bags they give away with purchase? 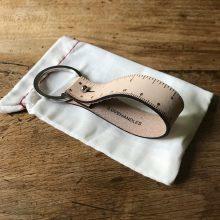 I keep my circs in their original little envelopes, in such a bag, in size and length order. The best thing: I use a small sticky note to write what project said needle is in. Then all I have to do is find the project bag … with the UFO.Did I mention that I make project bags … so I have a lot, complete with UFOs? 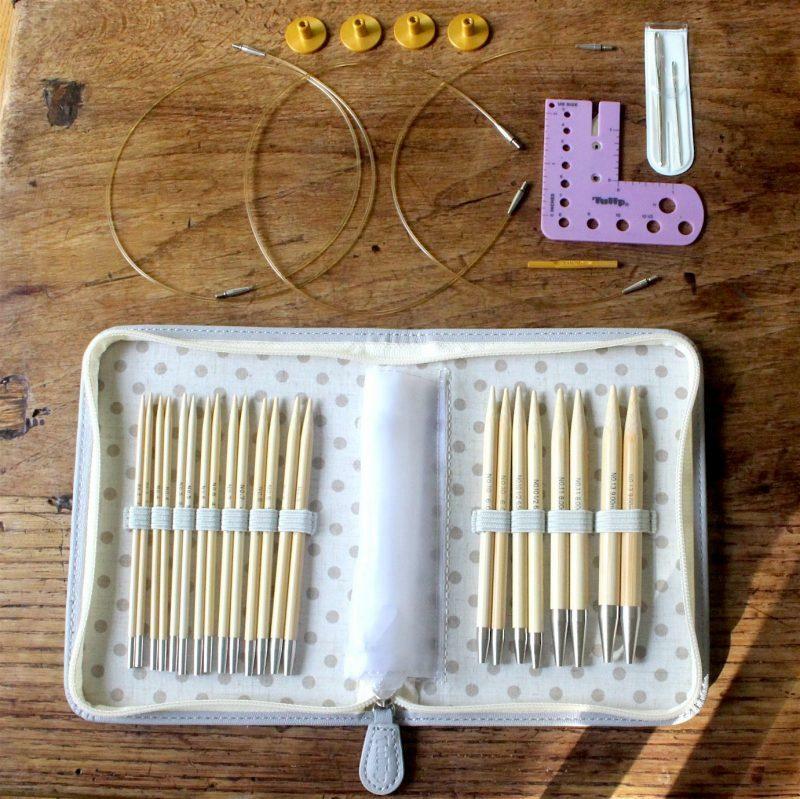 This being said (writ) I bought a Addi lace set, and though I love the needles, I find joining them to the cable very very awkward and difficult to do – so difficult that I put a rubber grabber in the case. Oh, man. I am a sucker for an interchangeable set. You say the tips are pointy? I’m thinking I might need these…. I love a good set of interchangeables! Glad you found an amazing one that works for you! You forgot to share the detail about how the cord join swivels. That was the thing I loved most. I have only been able to find the short tips, so I’ll be ordering some from you! You are right. That is how much of a newcomer I am to interchangeables, that I didn’t realize that was noteworthy. But of course it makes the stitches slide around so effortlessly. THE CORD JOIN SWIVELS, PEOPLE! That does it. That’s the deal-maker. Sold! The last line of this post gave me a much needed chuckle. Thanks!! 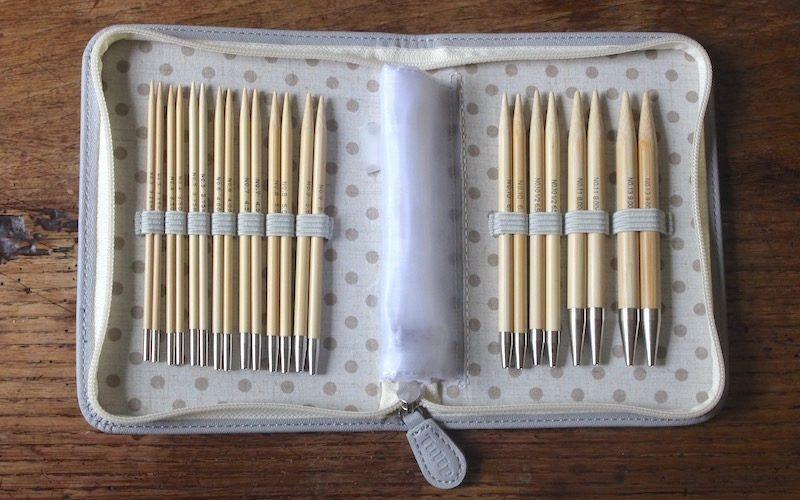 I have used beautiful handmade wooden needles (regular points and lace) from DyakCraft in Chester, Va. Wonderful to work with, no connecting tools. Extra cables, connectors, needles for sale. Broken (a rarity) needles replaced without charge. The needles come in spectacular woods and metals. The makers have a strong, loyal following on Ravelry, too. Lots of testimonials. I certainly love mine. Oh Kay, I believe you are living my interchangeable needle life. I can’t wait for my tulips to arrive. Happy holidays to me! I also kept buying one circular needle after another, various sizes and lengths. I did make a chart at one point to keep track of what I had, but the one-at-a-time approach was getting expensive and bulky. Thanks to an article or letter here (you enablers, you!) I discovered Fringe Supply Co. and their Lykke Driftwood Interchangeable needles (they also have sets of dpns). They are so satiny and a pleasure to work with. I ordered extra cables for the set. Still plugging away at the Eddy wrap with them! Long car ride to a quilt show tomorrow which will help me get a few more fans knit. I’m glad to hear you have found a solution to “sudden join release” – the horror stories like yours have kept me from craving a set of interchangeables. I have bought individual circs as needed, but not often – most recently for a hapalong, which was probably 3 years ago. The problem with my circ needle storage is that with small needles it is REALLY DIFFICULT to read the size, so each circ really needs to be kept in it’s own little transparent bag/container with a giant number scrawled in Sharpie on the outside. And my personal problem with circs is that I’ve never found a cable of just the right floopiness. The worst was one that resisted every trick to relax it’s determined coil, and at last, figuring there was nothing to lose, I cut the cable with a vague last-ditch notion of attaching some sort of “stop” to the ends…a lump of clay? a button? a brick? I don’t know. It wasn’t a great idea, because even those half-cables remained more rigidly coiled than a Herdwick’s horn. But I’ll bet you a dollar those remnants of frustration are in the bottom of my knitting needle drawer right now. Ooooooo from the looks of those I have a hunch that they use the same standard screw size as the Boye set (for which I MacGuyvered my own interchangeable cords following another obsessive knitter’s online tutorial, because the needles are good but the cords are terrible). Hmm. Hmm! You convinced me. I ordered a full set. I too had tried different interchangeables in the past and the main difficulty too was that they came unscrewed while knitting–which is, as you describe, a horrifying event! 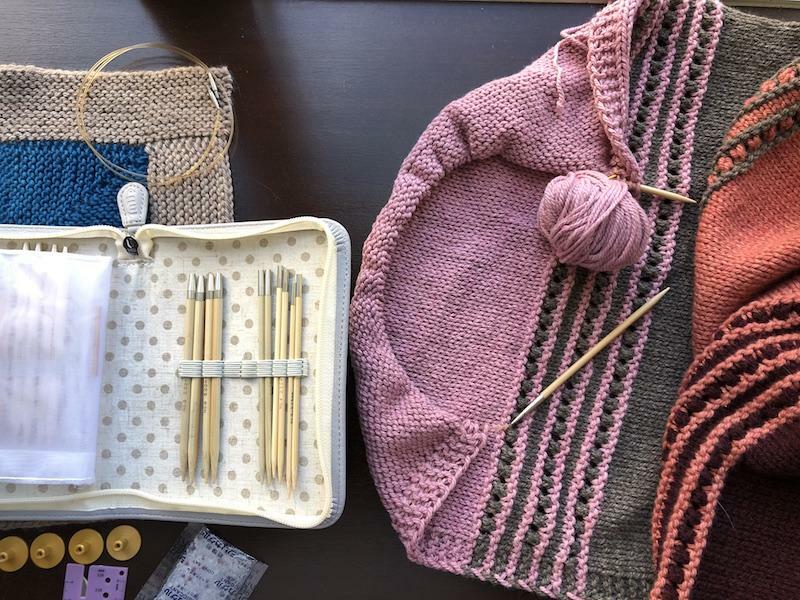 I ordered a full set and some extra cables, but I just have to share how I have my single circulars organized, after trying so many different methods. I bought a big plastic portable file cabinet with folders. I wrote the needle size on the folder tab, and put the needles in each folder. It’s the best I could come up with, after trying the hanging organizer and other methods. But you still have to grapple 🙂 There’s no getting away from that. And sometimes I’d get so riled up trying to separate multiple ‘copies’ of the same size, I would just upend the folder on the floor where I could separate them out. Which kind of cancels out the whole claim to have found a method! I have a separate cloth case just for the signature needles I acquired in the past. I love those, but then they went to interchangeable and those did not stay fastened, plus the cable was so tight and twisted up–they might be better now. It’s a difficult thing to resolve. That’s why I’m so glad to read here that someone has found a solution! OMG, who hasn’t had a needle head pop off interchangeables? LOL!! I was making the world’s largest (plain) knit afghan up at the IGHAU state softball tourny one year, knitting away, when my one needle head popped off…..right at the end of the row, no less…..TUL…..no dropped stitches!! I had not…..not…..brought a torquing pin with me…..Oh, mercy! I picked up the needle, screwed it back on, maybe I cried…..?…..looked down…..there was this metal coil thingy laying on the bleacher floor…..I snagged it and gave it a speech, “You will torque my needle head and tightly!” I kid you not, it was a perfect fit! I still don’t know what that thingy is called and I still have it!!!! So, I torqued the other end, too…..and since then when I finish a row, I will torque both ends…..yup!! My tool kit, and I don’t mean my crafting tool kit, now contains a spare torquing pin! LOL!! And, I still prefer fixed circulars; LOL!! But do the cables bend at the join after a certain amount of use as do the Addi cables? Mine haven’t. The cable swivels at the join, which probably helps prevent it bending. Just curious. Is the pattern for the blue and tan square that is shown in this article in one if the field guides? It’s so pretty! It has a slight modification to make the center a square instead of a cross, which actually makes it even easier to knit (and 8 fewer ends to weave in). These are tempting. Further research reveals the cables turn, and don’t kink – a real plus! Additionally I see that the Tulips are only available in bamboo, which sadly I think might slow down my knitting. For now I’ll stick with my beloved Hiya Hiya sets. I bought myself a set for Christmas and it already came unscrewed in the middle of a row! I’m sticking with Chiaogoo lace fixed!